DETROIT — Earlier today, the Michigan Laborers, joined by local citizens and lawmakers, called for a renewed push for both state and federal funding to improve Michigan’s crumbling roads and bridges. 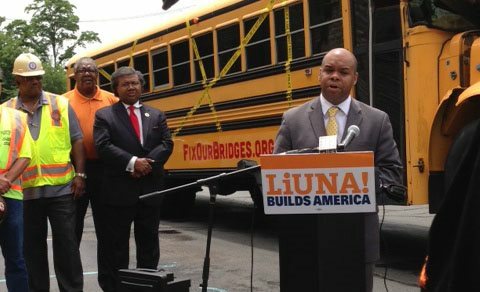 The Laborers staged a press conference at Christ Church Detroit where they featured the “Getting Schooled in Infrastructure” school bus. 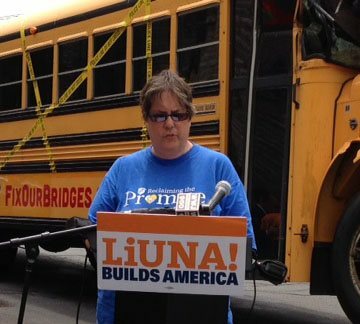 The prop is part of a campaign by LIUNA – the Laborers’ International Union of North America – to press Congress to pass a long-term, full-investment Highway Bill this year. The prop features a real school bus, which has been crushed and carries a prop resembling a large piece of a fallen bridge. 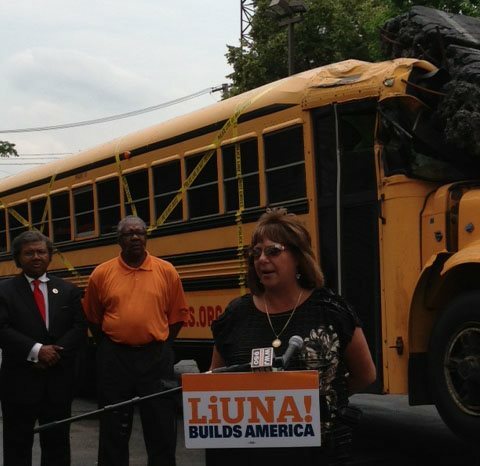 The bus also speaks to Michigan’s lack of necessary road funding and serves as a wake up call to Michigan lawmakers. State Senator Bert Johnson, State Representative Marilyn Lane and Dearborn Schools bus driver Liz Ellis joined Aaron at the press conference. The stop in Detroit was the first destination on the “Fix Our Roads” tour, where Laborers will be traveling across the state pushing for more infrastructure funding to improve Michigan’s roads and bridges. Ellis, who has been a bus driver for 25 years, said over the years she’s seen the roads get worse and worse and she called on Michigan lawmakers to act.